1. Click the <<ItemExhibitName>> button to view the exhibit. Given the form in the exhibit, which code segment would properly add 10 to the input contents of field a and display the results in field b? 2. Which type of errors can be trapped by SQLCA.SQLCODE? 3. 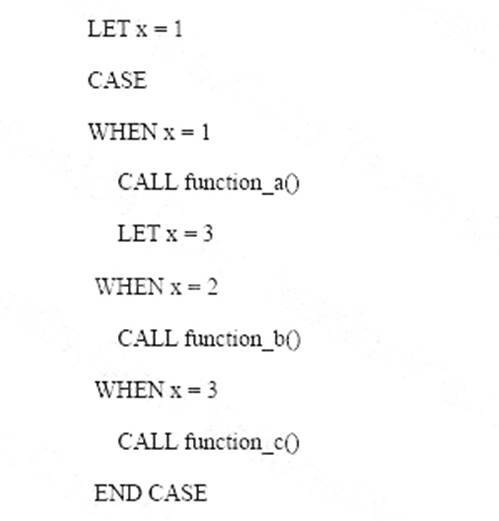 Which statements will be interrupted if the DEFER INTERRUPT statement has been executed and the user presses the interrupt key? 4. Click the <<ItemExhibitName>> button to view the exhibit. Given the segment of code in the exhibit, what is the appropriate text for the variable what_error_message? A. The serial number you entered is not valid. B. 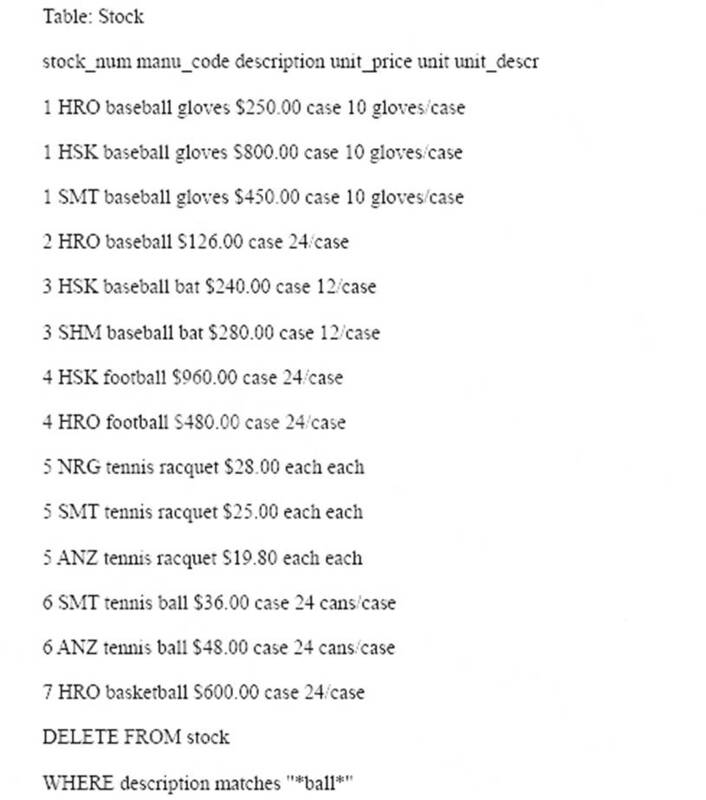 Duplicate equipment records are not allowed. C. Equipment was not found, please re-enter the serial number. D. Null values are not allowed in name, serial number, make, or model fields. 5. Which are valid INFORMIX-4GL function types? 6. Click the <<ItemExhibitName>> button to view the exhibit. Given the exhibit, which rows will the DELETE statement delete? 7. Why will preparing UPDATE and DELETE statements increase their execution speed? A. UPDATE and DELETE statements can NOT be prepared. B. The rows of the tables being selected will be cached in memory if the statement is prepared. C. Prepared statements are checked for syntax and optimized at prepare time, not at execution time. D. Memory is allocated for the results set which will be returned from the SELECT statement at prepare time. 8. Click the <<ItemExhibitName>> button to view the exhibit. 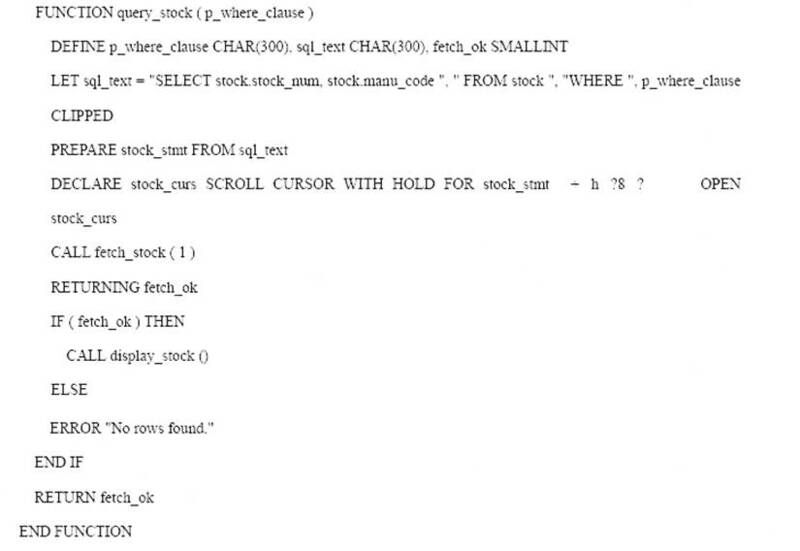 Given the exhibit, what is the stock_curs cursor being used to do? 9. Which values will the form display when using the INPUT ARRAY statement? 10. Click the <<ItemExhibitName>> button to view the exhibit. Given the code segment in the exhibit, which function(s) would be called? 11. Which qualifiers can be used when formatting report output? 12. Which statement is correct about the BEFORE MENU clause of the MENU statement? A. It will execute before the menu appears to the user on the screen. B. It is required to check user access privileges before displaying the menu. C. It is the only place that the HIDE OPTION and SHOW OPTION statements can be used. D. It is required before variables can be used for the menu-name, option name, and option-description. 13. Which sequence of steps opens a form and displays it on the screen? 14. What are characteristics of INFORMIX-4GL RDS? A. It provides a graphical user interface. B. It can use the INFORMIX-4GL Interactive Debugger. C. It compiles faster than INFORMIX-4GL Compiled Version. D. It executes faster than INFORMIX-4GL Compiled Version. 15. Which statement about INFORMIX-4GL is true? A. The INFORMIX-4GL C-compiled version requires a p-code runner to execute. B. INFORMIX-4GL for Windows is only offered in the RDS version of the product. C. The INFORMIX-4GL RDS version compiles faster than the INFORMIX-4GL C-compiled version. D. The INFORMIX-4GL RDS version executes faster than the INFORMIX-4GL C-compiled version. 16. What is one advantage of using INFORMIX-4GL C-compiled version versus INFORMIX-4GL RDS? B. It executes the program faster. C. It uses the INFORMIX-4GL Interactive Debugger. D. It readily accesses a graphical presentation of your application. 17. An end user wants to see how values x and y are being set in function1 and function2, and also needs to know the value of z before function3 is called. 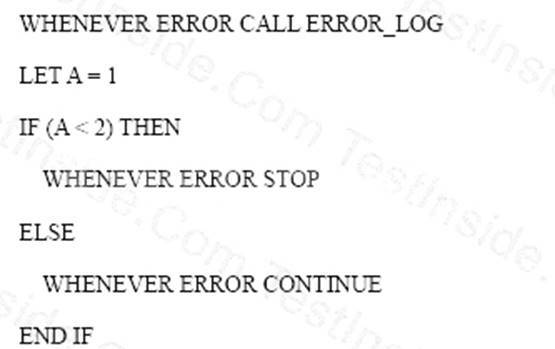 Using the Informix 4GL Debugger, which sequence of steps accomplishes this? 20. Which cursor type can use the FETCH PREVIOUS syntax? 21. Which statement transfers fields on a form to program variables? 22. What does the INPUT statement do? A. It defines variables used in a form. B. It moves a user through the fields in a form. C. It automatically opens the form and displays it. D. It assigns a field in a form to a program variable. 23. Which clauses must be included in an INPUT statement? 24. Which statement uses correct syntax for the INPUT statement? 25. Click the <<ItemExhibitName>> button to view the exhibit. 26. Which INPUT statements are syntactically correct? 27. What is the effect of the WITHOUT DEFAULTS clause of an INPUT statement? B. It prevents user input of DEFAULT values in the form. D. It initializes the program variables to their table-defined defaults. 28. Which are valid clauses of an INPUT statement? 29. Which statements can be used in an INPUT statement control block? 30. Click the <<ItemExhibitName>> button to view the exhibit. Given the form in the exhibit, which code segment would properly add 10 days to the input contents of field a and display the results in field b? 31. Which code segment will show field-specific help at the user s request during an INPUT statement? 32. What is the primary function of the INSERT statement? 33. When is the column-list optional in the INSERT statement? 34. Which statements are true about the INSERT statement? A. The INSERT statement can be used with a cursor. C. A single INSERT statement can insert rows into multiple tables. D. Every column in the table must be referenced in the INSERT statement. E. The INSERT statement can insert multiple rows into a table if it uses a SELECT clause. F. Columns not mentioned in an explicit column list will be assigned a value from a DEFAULT CONSTRAINT, if one exists for that column. 35. What must be done prior to using an EXECUTE statement for an INSERT statement? A. SERIAL numbers must be assigned. B. The INSERT must have been prepared. C. All columns must have non-NULL values. D. An INSERT CURSOR must have been declared. 36. What is the proper method for inserting a value into a column assigned a data type of SERIAL? B. Set the program variable for the serial column to zero. C. Set the program variable for the serial column to the next highest value of the SERIAL column. D. Exclude the program variable for the serial column from the INSERT statement enabling the database to insert the correct SERIAL value. 37. How can you programmatically determine the SERIAL value assigned after inserting a row? A. Use the get_diagnostics() function. C. Check the value in the SQLCA structure. D. Track the SERIAL value in a program variable. 38. 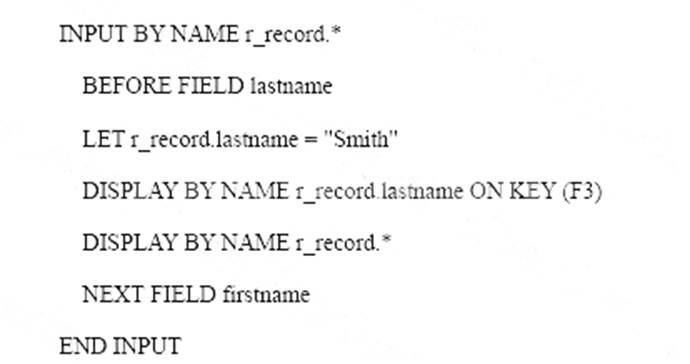 Other than when a zero value is supplied for a SERIAL column, when will the database assign a SERIAL value? 39. Click the <<ItemExhibitName>> button to view the exhibit. In the exhibit, assuming all of the program variables have been populated with the appropriate data, which statement should be used to put the values into the employee table? 40. Which statement is true about the SERIAL data type? A. A table can have multiple SERIAL columns. B. SERIAL values within a table MUST be unique. C. SERIAL values are stored in the database as integers. D. Once deleted, SERIAL values are automatically reused. 41. What must be true for this statement to execute? A. The statement must be prepared. B. gr_cust must be a global variable. C. gr_cust must contain non-null values. D. gr_cust must have a structure like the customer table. 42. 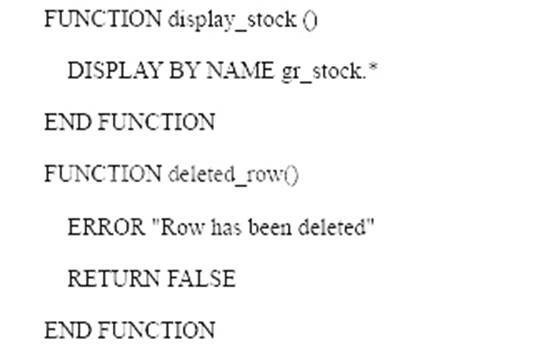 Given this statement, if the customer table contains a SERIAL column, which statement should be executed prior to the INSERT? 43. Which structure contains information about the most recently executed SQL statement? 44. Which statements are true about SQLCA? A. SQLCA is implicitly defined. B. SQLCA.SQLCODE and STATUS will always contain the same values. C. One copy of the SQLCA structure is defined for each SQL statement. D. SQLCA is an abbreviation for Structured Query Language Communications Access. 45. Which are components of the SQLCA record? 46. What does an SQLCA.SQLCODE value of zero indicate after an SQL statement is executed? A. No data was found. B. The statement did not execute. C. The statement executed without errors. D. Multiple errors occurred that are listed in the SQLCA.SQLERRD. 47. For a non-ANSI database, if an UPDATE statement executes successfully, but modifies no rows in the database, what will SQLCA.SQLCODE be set to? 48. 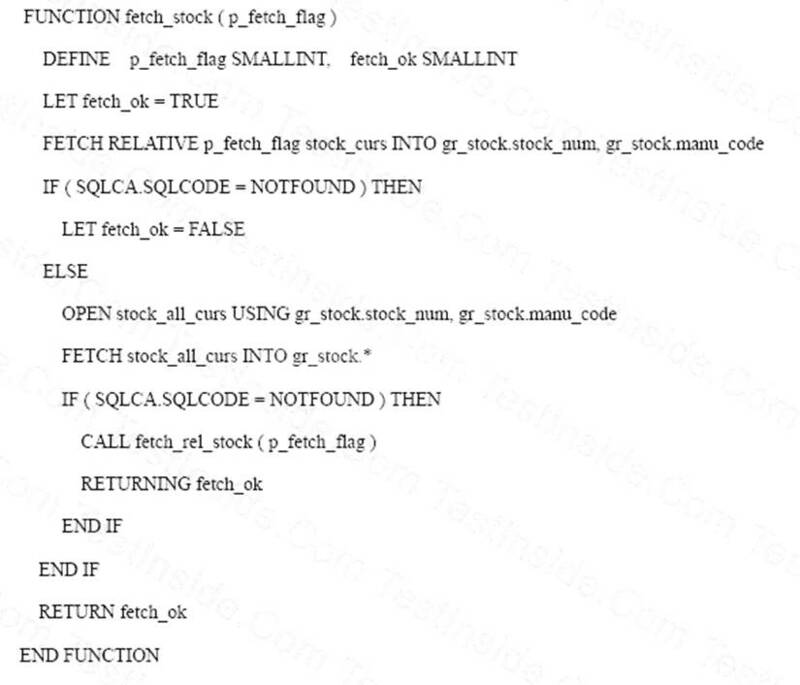 When checking the return status of an SQL statement, why is it advisable to use SQLCA.SQLCODE instead of STATUS? A. The STATUS variable is always set by INT_FLAG. B. STATUS may have inadvertently been set by a 4GL application statement. C. The STATUS variable may have been incorrectly defined by the developer. D. The STATUS variable is not set by SQL statements, only by 4GL application statements. 49. When checking the return status of 4GL application statements such as PROMPT, why is it advisable to use STATUS instead of SQLCA.SQLCODE? B. The SQLCA.SQLCODE variable may have been incorrectly defined by the developer. C. The STATUS variable is not set by 4GL application statements, only by SQL statements. D. The STATUS variable is the only way to check the return status of 4GL application statements. 50. When would you want to use both STATUS and SQLCA.SQLCODE? A. When using the C-compiled version of 4GL. B. Never. Programs should use either method exclusively. C. For portability because certain 4GL ports support STATUS and others require SQLCA.SQLCODE. D. The program needs to execute 4GL application statements prior to checking the return status of the most recently executed SQL statements. 52. At run-time, conditions may occur that produce warnings, but not errors. How can you easily look for these warnings? A. Check STATUS for >0. B. Check SQLCA.SQLAWARN for specific warning numbers. C. Check SQLCODE, if set to >0, examine contents of each SQLCA.SQLAWARN component. D. Check SQLCA.SQLAWARN, if set to “W”, examine contents of each SQLCA.SQLAWARN component. 53. Which errors are 4GL run-time errors? 54. Which statements are true about the WHENEVER ERROR statement? A. It will result in the STATUS variable being reset to 0. B. It can be used to handle unexpected program terminations. C. It traps fatal errors during execution of 4GL statements. D. It can not be used to trap warnings during execution of 4GL statements. 55. For a non MODE ANSI database, what is the default behavior for handling a run-time error? A. The program continues, logging the error to the error log. B. The program displays an error message and the program is terminated. C. The program executes the default handler provided in the run-time libraries. D. The program is interrupted, issuing a prompt to the user for further processing direction. 56. Click the <<ItemExhibitName>> button to view the exhibit. 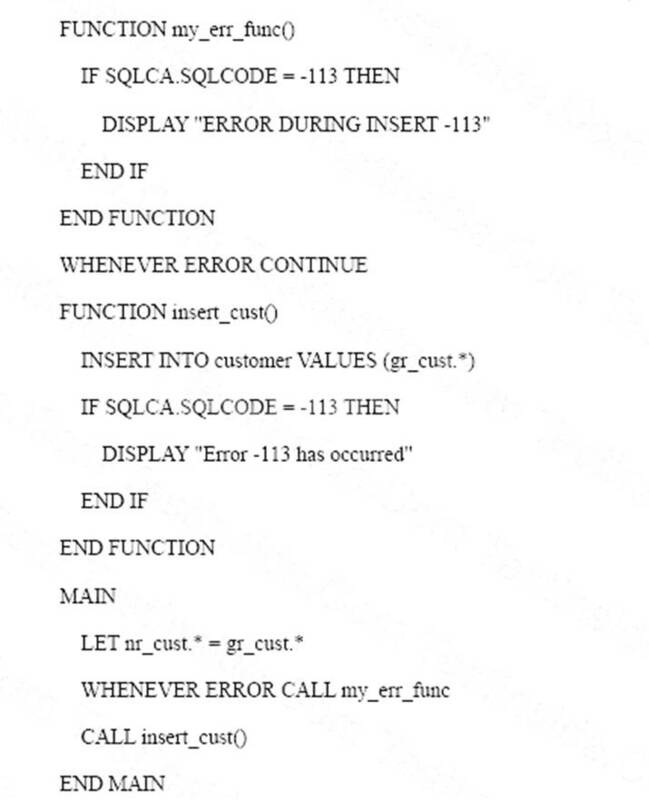 Given the exhibit, if error -113 occurred after executing the INSERT statement, which error message would display? A. Error -113 has occurred. B. ERROR DURING INSERT -113. C. None, the error would be ignored. 57. Which statements are true about the WHENEVER ERROR statement options? A. WHENEVER ERROR STOP terminates the program immediately on receipt of an error. B. WHENEVER ERROR CONTINUE continues execution on receipt of an error and data NOTFOUND condition. C. WHENEVER ERROR STOP terminates the program immediately, for all error and data NOTFOUND conditions. D. WHENEVER ERROR CALL causes execution of the 4GL run-time library error-handler upon receipt of an error condition. 58. Click the <<ItemExhibitName>> button to view the exhibit. Given the code in the exhibit, which statement is correct? A. The WHENEVER ERROR CONTINUE is active while in function A. B. 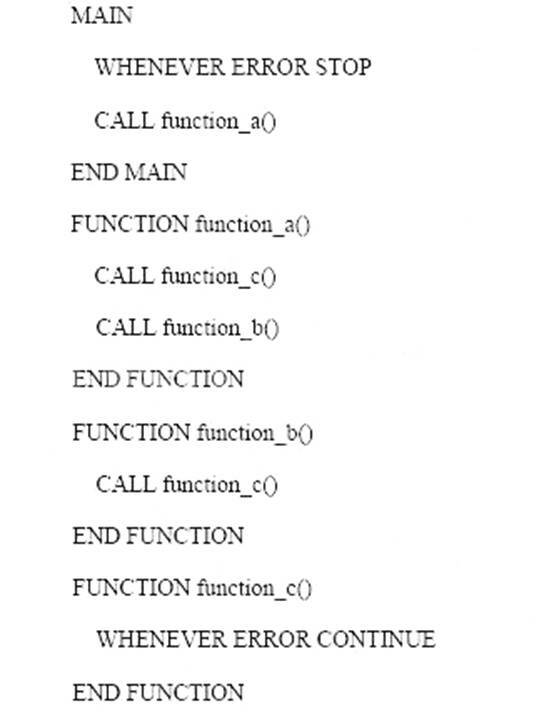 The WHENEVER ERROR CONTINUE is active when function B is called. C. The WHENEVER ERROR STOP is active for MAIN, function A and function B.
D. The WHENEVER ERROR STOP is active throughout as it was declared in the MAIN function. 59. Click the <<ItemExhibitName>> button to view the exhibit. Given the code segment in the exhibit, which WHENEVER statement is active after exiting the IF statement? 60. What does the DEFER INTERRUPT statement trap? 62. Which statements can be interrupted once a DEFER INTERRUPT has been set? 63. When is int_flag set to TRUE? 64. How is the int_flag set to true? A. The user presses the quit key. B. A character value is copied into an integer data type. 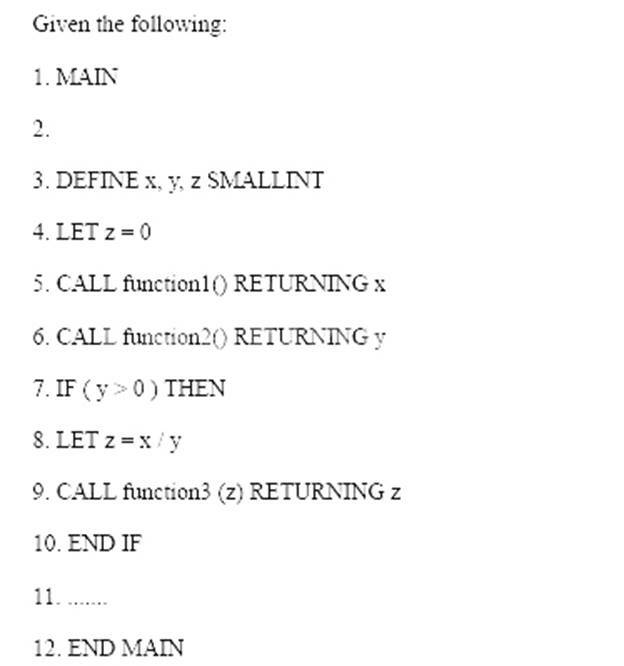 C. An arithmetic operation causes a smallint or integer value to overflow. 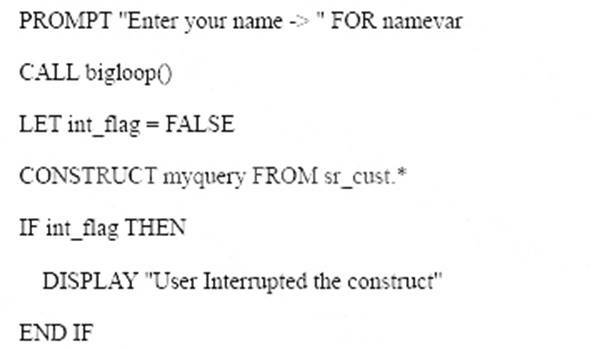 D. A DEFER INTERRUPT statement is executed and the user presses the interrupt key. 65. Click the <<ItemExhibitName>> button to view the exhibit. 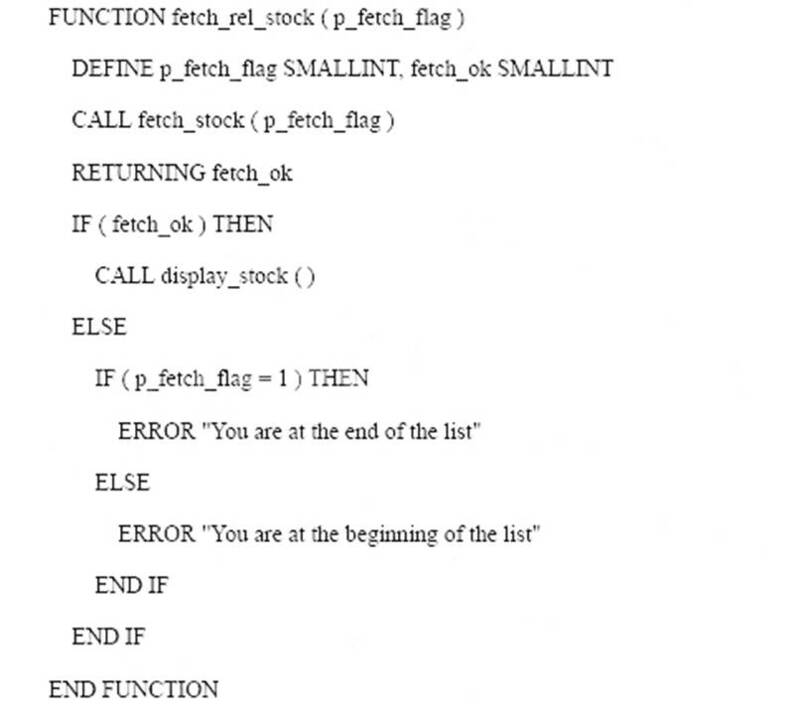 Why is the line "LET int_flag = FALSE" and its placement in the code segment important? A. It disallows users from interrupting the CONSTRUCT phase. B. Integer fields are to be skipped during the CONSTRUCT phase. C. The interrupt may have been previously set to TRUE during the PROMPT or bigloop(). 66. If DEFER INTERRUPT is set at the beginning of the application, why must your application set int_flag to FALSE before an INPUT statement is executed? B. The application will immediately exit if the user presses the interrupt key. 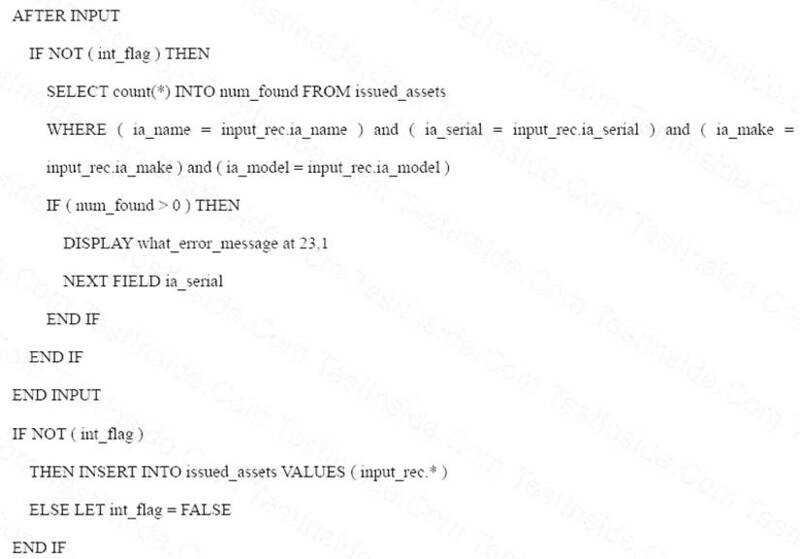 C. An error will occur if int_flag is not reset to FALSE and the user presses the interrupt key. 67. After a user-interrupt sets the int_flag to TRUE, how can it be reset to FALSE?